We’ve been hearing a lot about orange blossom oil lately as an additive to hair-care products, and for good reason. This sweet and floral oil, better known as neroli, has been used for everything from revitalizing hair to promoting emotional balance. The name neroli distinguishes it from orange blossom water, a far less concentrated version than the oil. Both have an outstanding, unusual, sweetly strong scent that many find heavenly. Orange blossom water is very light and used in African and Middle Eastern cooking and in European homemade beauty products. Neroli, on the other hand, has a lengthy history in perfume beginning centuries ago in Persia (present day Iran), where it was used to perfume royalty and palace walls. Neroli is popular in India, and has slowly been introduced into hair and skin care products in the West because of its numerous health and beauty benefits. Neroli, one of the world’s most expensive oils, originated in the Far East and is believed to have been introduced to the Mediterranean by Arab traders. It has intimate ties to both the east and western culture, especially royalty, making its true name origin hard to decipher. It is said that the word Neroli is derived from naranj, which means orange in Arabic or from the Sanskrit word, nagaran. Thanks to the Moors, the oil made its way further north and further west. Neroli oil was eventually carried into the Mediterranean region. And, by the end of the 12th century, bitter orange trees were being cultivated in Seville, Spain for the production of this highly sought-after essential oil. The royalty of Europe also lay claims to the word neroli. Some say it is named after the 16th century Princess Anne-Marie of Nerola, wife of Prince Flavio Orsini. She is said to have loved the scent, wearing it frequently, which in turn inspired other aristocratic women and wanna-bes who could afford it to use it as well. Others say it is named after Roman Emperor Nero. Still others claim, 17th century Duchess of Tremoille, known as ‘La Nerola,’ wore it to scent her gloves and calm her nerves. We do know for sure that in European tradition the blossoms were woven into the bride’s bouquet probably for their calming effect. They were woven into the bride’s hair to proclaim her virginity and placed by the honeymoon bed to calm nuptial nerves and assure fertility. During that period of time, Neroli oil was often used in bath water or as a perfume on stationary and clothing. Its rich, floral scent gained almost instant popularity and was used commercially by J.M. Farina, the famous Italian perfume manufacturer. In 1709, he began selling an essential oil blend of Bergamot, Lavender, Lemon, Petitgrain, Rosemary and Neroli. He called this magical blend “Eau de Cologne”, which is still quite well-known throughout today’s modern world. The scientific separation between neroli and orange blossom oil is clear. Neroli is steam distilled whereas volatile solvents are used to extract orange blossom oil. Neroli is stronger and longer lasting whereas orange blossom products are lighter and more ephemeral. 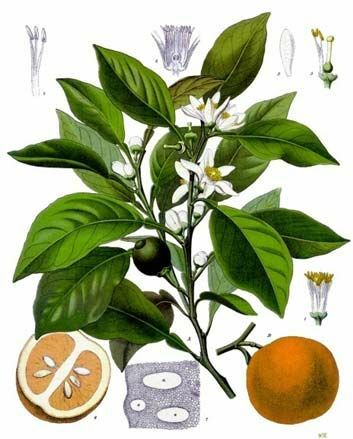 Neroli essential oil’s origins are in the Far East, but it now is cultivated primarily in Italy, Tunesia, Morroco and Egypt from the steam-distilled blossoms of the bitter orange tree. Like rose oil, this oil’s valid expense is driven by the enormous amount of blossoms necessary to produce Neroli essential oil. In fact, 1 ton of orange blossoms are required to produce one quart of Neroli oil. Neroli oil is the extracted essential oil of fragrant blossoms from the bitter orange tree. However, before the orange blossoms may be used in the distillation process to produce essential oil, all traces of debris, including green leaves and twigs, must be removed by hand. There are many different types of hydrosols and essential oils created from various types of orange trees and from specific parts of the tree. The ordinary edible orange, which grows so well in Florida, is Citrus sinesis. An inexpensive essential oil is produced from this tree, but it does not have the same therapeutic benefits as neroli. Orange essential oil from the fruit is usually called just that, and it is used mostly in home cleansing products. The delicate blossoms, rather than the fruits, are used to create the pale yellow neroli and orange blossom water. Its botanical name is Citrus bigaradia or C. aurantium. Petigrain created from the tree leaves and twigs has more of a spicy scent and it comes from the tree, Citrus aurantium. In the East, neroli has long been associated with the second chakra, (the sacral spinal area) in India’s yogic tradition. Yogis and practitioners of Aruyveda admire neroli for its trance and sleep inducing, relaxing qualities. They rub it on the abdomen or sacral area. In Chinese tradition the oil is used to mobilize chi. In the west it is used aromatherapeutically to alleviate depression, soothe anxiety, hysteria and nervous conditions. As a light, refreshing, uplifting fragrance, it is used to alleviate a variety of psychological states including insomnia, anxiety and depression. It is known to help treat diarrhea, and some aromatherapists use it to treat a broad range of menopausal issues. Neroli oil has been noted to improve varicose veins, skin elasticity and the body’s ability to develop new skin cells, while working to soften the skin, wrinkles and scars. Neroli oil may also be able to regulate oiliness, minimize enlarged pores and clear blemishes, making it good to use on oily skin and hair. Anti-oxidant properties encourage healthy cell growth allowing neroli to boost and revitalize dull looking hair. Neroli also is helpful in treating many types of dermatitis and scalp irritation. This once-exotic, elite oil is now used by many to calm skin rashes, diminish stretch marks and scars. Neroli is a maturing woman’s best friend, combating wrinkles and conditioning the texture of the skin. It also helps with various manners of the heart as a purportedly effective aphrodisiac, alleviating sexual tension and even as a cardiac tonic. Often people with fresh cornrows, French braids, Senegalese twists, Nubian knots, locs and individual braided extensions experience discomfort (pain) and scalp irritation. The following two neroli astringents can be dabbed on the parts of these styles with a cotton swab to alleviate the transition to braids, locs or twisted hairstyles. These can also be used to cleanse the face before applying a moisturizer. The hair and skin astringent combination works well because often long hair that is braided or twisted hangs in the face releasing unwanted oils onto the skin. Mix ingredients in a non-reactive bowl. Pour through a small funnel into a 6 ounce bottle. Dab on skin with a cotton square thoroughly cleansing. This is another easy to make astringent. By adding about 8-10 drops neroli to 16 ounces witch hazel in a non-reactive bowl and funneling into a clean, dry bottle. This is immediately ready to use—just shake very gently before use. Apply to the scalp (in the parts) or all over the face, working upward with cotton squares, to cleanse, sooth or calm the nerves. 8 drops each: evening primrose oil, carrot seed oil and lavender essential oil. Swirl to blend. Pour through a funnel into 6 ounce sterilized, dry bottle with screw cap. Dab on face with a cotton ball at night before bedtime. In order given, add ingredients to non-reactive bowl. Swirl gently to mix. Using a funnel add to 6 ounce clean, dry, bottle with flip top. Use as a massage or intimate oil. A couple of good online essential oil suppliers are: www.100pureessentialoils.com and www.libertynatural.com (which requires a $50 minimum). Liberty Natural Products also sells bottles, jars, absolutes and many other natural ingredients. Wholesale Supplies Plus at www.wholesalesuppliesplus sells a base shampoo, conditioner, bubble bath, body butter, lotions and creams to which you can add neroli or other essential oils quickly producing your own unique products. This company also sells bottles, jars, funnels and labels. One of the better bottle companies is Sun Burst Bottles at www.sunburstbottles.com. They sell jars, a variety of bottles and labels.